The Kalispel Tribe, nearly annihilated (dropping from 1,600 members in the early 1800s down to 100 members in the early 1900s), now is a Tribe numbering about 450. In the 1960s, the reservation – a tiny piece of their former homeland – was a place of poverty: one telephone, a few homes with running water. Today the Tribe is among the top ten employers in the Spokane region with about 2000 employees. The Tribe through its Charitable Fund has given away $18 million since 2000 to programs for the poor, to save the Salish language, and for environmental stewardship. The Tribe continues to face considerable challenges. 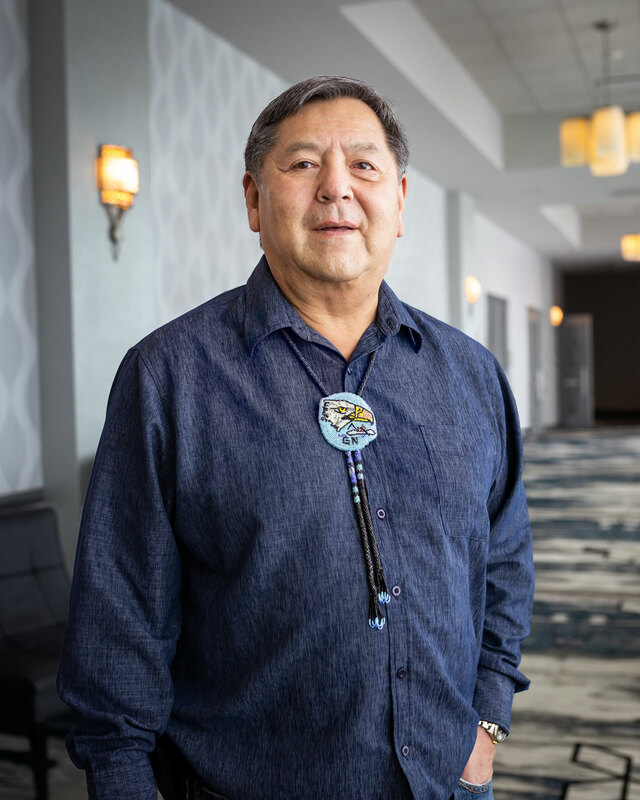 This interview took place at the Northern Quest Resort & Casino, Airway Heights, Washington, on the morning of February 25, 2019, in preparation for honoring the Kalispel Tribe of Indians as Watershed Heroes on March 1, 2019. Glen Nenema, Chairman, Kalispel Tribe of Indians. 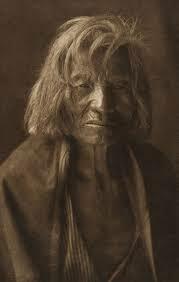 John Osborn (JO): Chairman Nenema, at the time of first contact in the early 1800s, the Tribe numbered 1,600. By the early 1900s only about 100 tribal people were left, and had been nearly annihilated. Not until 1914 did the United States establish a tiny reservation for the Tribe. In the 1960s Tribal people were impoverished, there was only one telephone that served the reservation. By contrast, since 2000, the Kalispel Tribe, through its Charitable Fund, has donated $18 million to support programs that serve the poor, to keep alive the Salish language, protect the environment, and other civic works that advance the common good in the region. By any measure, the journey of the Kalispel Tribe has been astonishing. Would you begin by telling us about this journey of your Tribe through your eyes. Chairman Nenema: This is not any different than what our ancestors endured. They persevered. They survived. Today we have different programs through which we are trying to give our young people opportunities to live in this world. In no way do we want to give up our culture and our language. We need to care for the land that we have been on for centuries. We are faced with threats to our natural resources. The health of our tribal members is a priority. JO: You were born in 1951. In your lifetime, you have seen tremendous change. Can you talk to us about that change? Chairman Nenema: The changes that I struggle with now are the fast-paced life of today. As a young person living on the reservation, life was much simpler. I got to know my great grandfather. I was raised by my great grandparents and my grandparents. My Mom was part of my life too, she was living off the reservation and I stayed on the reservation. What people consider being poor back then was actually rich in many ways. We try to remember that every day as we make our decisions. I can only hope and believe that our ancestors agree with us, and recognize that we did what we had to do. Up where we were on the reservation there were few opportunities to survive in this world of today. We had to create opportunities. With the changes, some people are having a hard time adjusting to – the 7 to 5 or a 9 to 5 jobs. Some have adjusted, and some haven’t. You asked me about what changes I’ve seen. We came through some hard times, from the 1970s and ‘80s up until the ‘90s. We struggled with alcoholism, and a lot of neglect and abuse which came from our people losing everything. These impacts were passed down generation to generation too. I wanted to set up the Camas Institute for education and also for the behavioral health area for addressing the spiritual, mental, physical, and emotional needs. Education included taking care for our language program. I was raised around the Salish language, but I lost a lot of it starting in the 1970s. The Salish language is coming back and that makes me feel good. Another area that is important is early childhood development. We have all of our children going. It’s far more than just a daycare. Our children are coming into the first grade sometimes at a second or third grade level, ready, and reading. When I see the children, it gives me more hope, makes me want to keep going. Other days are more discouraging, the things that I see people struggle with and the public in general. We have some real challenges ahead of us. The more healthy we are, the more likely we’ll survive just as our ancestors did before us. JO: In my own work as a physician caring for Veterans in emergency rooms in Spokane and now in Seattle, I certainly see Vets coming in off the streets struggling with alcohol, heroin, and methamphetamine, often coupled with mental health problems such as PTSD, depression, and thoughts of suicide. I also serve as the physician advisor for Camp Chaparral, a program for Indian combat Vets with PTSD and VA staff, hosted by the VA and the Yakama Nation. We look at traditional healing practices such as the sweat lodge. These healing practices help people connect to a more traditional life – which included the land and water, fish and wildlife – as part of maintaining mental and cultural health. Your thoughts? Chairman Nenema: I began my journey 31 years ago tomorrow. You talked about the sweat lodge. When you go in there you have all of the elements. You have the rocks, the water. That helped me get back in touch with Mother Earth. When I was struggling, one elder would just point. And I knew where he was pointing to: to get back into the sweat lodge. That got me back through the last 31 years. It has helped me in more ways than I think I know. JO: Giving youth a future that includes the land and the Rivers and clean air is so essential. I worry that our failure to address these larger environmental threats facing youth and future generations only adds to the pressure on youth and will worsen the already high rates of youth suicide. One of the benefits of the tribes’ work collectively stepping forward in their stewardship capacity has the benefit of protecting youth – not just tribal, but throughout our society. Youth are precious and vulnerable, and we must protect them. Chairman Nenema: We always believe in the seventh generation. How you do things today will affect the next seven generations. That’s why we have made the health of our people a priority. At the same time we face outside elements working against that. That’s a challenge. JO: In our work, we stand on the shoulders of those who came before us. You mentioned your great grandparents, your grandparents, your mom. Photographs of Kalispel leader Chief Masselow are displayed at the Northern Quest Resort – you look at the deep creases in his face and can only wonder about the tremendous pressures and responsibilities that came to him as the leader of the Kalispel people at that time. You also mentioned the elders. Would you share any reflections that you have about the importance of the elders and the ancestors in the survival of the Tribe then helping with the transition. Chairman Nenema: Just thinking back to when they had to make the decision on where to be: on the little bit of land that was left when they decided to make it a reservation. Some left for Montana. Others stayed. I cannot imagine having to make that kind of decision. One of the reasons that people stayed is because that is where our ancestors are buried. These lands are our home. And to just get up and move . . . I’m glad they stayed there. I don’t know where else we could be today, who knows. I respect what they did. We are trying to carry out what they started. They held onto that piece of land for us to carry on our traditions, knowing that that’s the only way we are going to survive. JO: Next let’s turn to water. Walking around the Northern Quest Resort, the reminders of the Pend Oreille River are everywhere: in the design of the building, the art work, and the historic photographs. The River is important to the Kalispel Tribe. Water is life. “Water is Life” is a phrase that has captivated and energized people around the world. 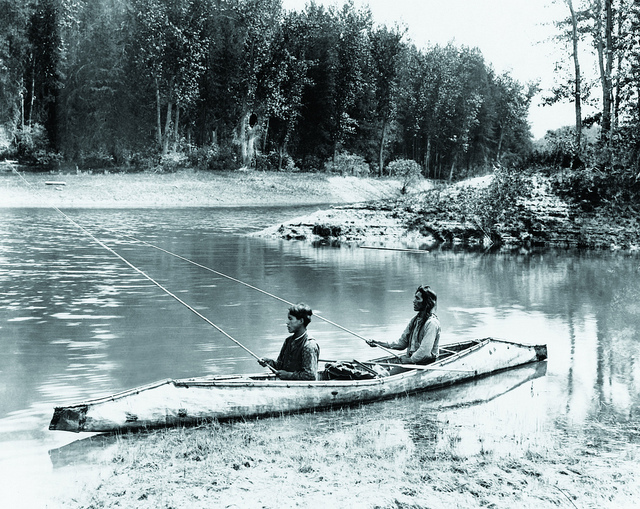 The Kalispel Tribe has, for decades, worked to protect the waters of the Pend Oreille River, your ancestral homeland. Would you describe generally your Tribe’s relationship to the earth, especially water and the River? Chairman Nenema: Our people are fishermen, gatherers, hunters. Fish were really important for food. The River was our highway between where we are and Montana. My grandmother told me stories as we drove from where we live to Montana, her pointing out places along the River that were camping sites for tribal people. Always by the River. When I was a boy I did some fishing. But by then the dams already came in and the fishing was going. I fished with my grandfather, he liked fishing on the creeks. We would also fish the sloughs for bass. We saw the invasives, the nonnative fish, coming in. But yes, fish are important to the Kalispel people. Our sturgeon-nose canoe was our transportation up and down the River. Every night I would go down and walk along the River. It’s about four miles. I always felt it was good medicine – to be there with the River and the mountains. Sometimes we ask the River to take away that which is hurting us, to take it downriver. By the time I got through with my walk, my head would be clear again. The water is strong medicine, more than we imagine. We always ask for answers. The answers come from somewhere. We are being watched over. JO: You talked about the dams that came in when you were young and the impacts. Today people drive past the dams on the Pend Oreille River, including the Albeni Falls dam and Box Canyon dam. Albeni Falls dam in particular has had a devastating impact on fisheries by disrupting the movement of fish between Lake Pend Oreille and the lower River. Can you tell us about the Tribes commitment to mitigating those impacts and restoring native fisheries? Chairman Nenema: How many years did we work on that with the PUD? When Deane [Osterman] first started working for the Tribe we were involved with a lawsuit against the PUD over Box Canyon dam. Albeni Falls dam was also built on our traditional lands. Both dams affected our fish and wildlife. Beginning with the Northwest Power Planning Act and through the years, we’ve always presented solutions. We’ve been involved saying this is what needs to be done. How many years did it take to get any funding? When we first started getting involved with the Northwest Power Planning Act, we had no funding and we had no technical people, no biologists, to read and understand what they were sending to us. It’s almost like you have one shot at it. We were lucky that we got involved with Eastern Washington University and their fisheries department, Dr. Allan Scholz. His students helped us and assisted us with the Northwest Power Planning, answering our questions and just understanding what was happening, and then with participating. We are just thankful for that help. The way government works, they were just hoping to move on and no one would say anything. They have to move forward and correct damage that has been done for years. Today we have technical ability that will help protect our future. JO: The Upper Columbia River region faces some of the most daunting pollution cleanups of mining and smelting wastes anywhere on earth. The Coeur d’Alene Tribe is struggling to cleanup its homeland of the Coeur d’Alene Basin. (link) The Colville Confederated Tribes is struggling to cleanup its homeland from Tech Resources polluting Lake Roosevelt. (link) The Spokane Tribe is struggling with uranium pits on the reservation and pollution plumes from the Spokane and Columbia Rivers (link). When you start connecting the dots, four conclusions can be made: (1) the Upper Columbia River Region, sparsely populated and distant from political capitals, is vulnerable. (2) State governments are at best weak advocates for their public trust responsibilities and at worst active in aiding and abetting the polluters, including mining and smelting corporations. (3) Tribes bear the brunt of the impacts, including being forced to step forward as sovereigns to demand that their traditional lands and waters be protected and restored. (4) While the tribes may be motivated by tribal interest, by default they often end up being advocates of the public interest and defenders of the common good in protecting the environment. In March 2018 the Kalispel Tribe of Indians issued public notice of a proposal to redesignate the Kalispel Indian Reservation as a Class 1 air quality area under the Clean Air Act. It has been reportered that this is a response to the threat of air pollution anticipated from a silicon smelter that is proposed by PacWest to be located in Newport, Washington. The Tribe is supporting a website Don’t Smelter Our Air, Don’t Smelter Our Future. Would you describe the importance of clean air and clean water to the Tribe and future generations, and steps you are taking? Chairman Nenema: It is important because this will affect our health. Some of the stories we hear from where these pollutants are already, the environment is mostly shot. If you come up our ways, you see the trees, streams and rivers. It has helped that we have made the public more aware of what’s at stake. You’ve talked about the state leaders who have different values. They see the profit. This country is famous for doing damage and then saying someone has to fix it down the road. We have dams on the Pend Oreille River that went in some fifty years ago. Already they have been licensed for another fifty years. If they would have listened to and addressed the concerns of people who do respect the environment, maybe they would have chosen not to do certain things. But profit comes first. I think we’re gaining on that, we’re getting more support. We are going to do what we had to do to protect our people’s health. I’ve been asked by non-Indians in our community if we would look out for them too. Yes, definitely. Deane Osterman: In my experience, state and federal regulators’ implementation of environmental statutes is often compromised by political interference and pressure from the regulated community. When regulators cave to this pressure, it leaves the tribes in the lurch. They can politically say “yes” to something because they know that in the end, the tribes will have to invest their resources to try and stop whatever damaging project comes along next. The smelter is a disaster in every way you can think about. This is the biggest case of greenwashing I’ve seen in the State of Washington in 25 years. Our “Climate Governor” and soon-to-be “Climate Presidential Candidate” is pushing this. He is pushing a filthy piece of industry on an economically vulnerable community. It’s an environmental justice problem the likes of which I’ve never seen. What’s happening today is like what happened in the 1950s when eight hydroelectric projects were built on the Pend Oreille because nobody could stand up against it. Then, it was the threat of the Cold War and we needed to make aluminum. We needed juice to do that. Now we need silicon to make solar panels. Governor Inslee has not done the Kalispel Tribe any favors. He has doubled down on this particular facility. If you dig into it, you’ll see just how empty the whole policy is. Chairman Nenema: When the Usk newsprint plant went in, Al Scholz was with me. We addressed issues that we thought needed to be in that permitting process. We asked for a baseline data study. The way they operate is that they hire a firm to come in and do the PR to get the people excited. They were promising jobs, $30 an hour. Thirty-some years ago those were good wages. We stood up and insisted on this baseline data study – because there wasn’t any baseline data. Immediately this company, Rest (?) International, got the community against us. I was attacked every time I went to the Cusick and Usk area, accused of holding up progress, “we need jobs,” “who cares about the frog” was brought up. We had to go these meetings, sometimes with 300 people wanting this newsprint mill, and we brought up our concerns, and it wasn’t popular. I had to live with that. We’re standing up for what we believe is right. Deane Osterman: Glen has giant shoulders. The Council has giant shoulders. The elders have giant shoulders. It is through Glen’s leadership and Council’s leadership that the Kalispel Natural Resource Department was created in the first place, and has the ability to do its work to protect the long term interests of the Tribe from environmental health and community health perspectives. I’ve come to know from working with Glen and other elders over a long period of time the tragic story that once the trust in a resource is lost, it is really hard to regain. You can lose that trust instantaneously. All you need to do is have a smelter, and then everyone’s trust in that air resource is gone. It will take decades to recover the trust between the people and the resource. That’s been the challenge for the Natural Resource Department, and the challenge for the Tribe. Glen was talking about family systems. This is really about systems. The Natural Resource Department is charged to understand, manage, and mitigate the environmental systems out there. These human systems and environmental systems all mesh together. We are not quite meshed yet. And I don’t know when that is going to happen. But we are getting closer and closer for those things to come together, a decade or so down the line. We are not remotely out of the woods in terms of the threats that the Tribe will face from its water quality concerns, its concerns about air. In twenty-five years, Glen’s time as Chairman, or even his time alive, the Tribe never once worried about air quality. Not once. Until we read on the front page of the newspaper that PacWest’s smelter was going to be built at Usk, Washington. Never heard about it. And then, all of a sudden, we have an existential threat to our community. We had to get up to speed on air rules and the Clean Air Act. Just overnight. JO: So this was a project that was funded by and supported by the Governor’s Office? JO: Could you describe the consultation process that occurred between the Governor’s Office and the Tribe on this project? Deane Osterman: There was no consultation process with the Tribe. There really is no difference between Governor Inslee’s project of statewide significance relative to the PacWest smelter and President Trump’s declaration of a national emergency to build the wall. They are both equally irrational. No consultation, no understanding of the environmental impacts of the smelter, all presupposed that all of the silicon will be coming out and going into solar panels to promote the solar industry. They have greenwashed this project. They claim there is going to be a net reduction in carbon. There are no data to support any of that. Chairman Nenema: These are the words they want us to believe. We were talking the environment, the ecosystem. Our bodies have a system too. We are trying to get a handle on what we are putting into our bodies. Seems like we are struggling with both. For a long time we’ve heard that everything is out of balance. We’re trying to get back into balance. JO: Listening to you speak reminds me of the indigenous saying “all my relations.” Deane mentioned the big shoulders – you, Council members, elders. But others too: the ancestors. When you walk into those angry rooms, you don’t walk in alone. The elders and ancestors are there with you. Chairman Nenema: I believe that. I do. There are days when you feel just alone. Totally alone. Then I remember that. When you get there, you are not alone. JO: In light of the Tribe’s work to protect the waters, lands, and air in the Pend Oreille – Priest region, what are the key elements that you want the broader public to understand about the Kalispel Tribe’s ongoing work? Chairman Nenema: This is our home. We can’t just get up and move somewhere else. And we’re not going to. And we will protect our home. I don’t know what else we can say or do. We are not going to apologize or justify to anybody for being there. For protecting our traditional ways. JO: The bones of your ancestors are buried along the River. There needs to be no apologies, no justification. Deane Osterman: As Glen has described, this has been the place they’ve always been. But even if you look at it more pragmatically from a contemporary perspective, you have a ground that is limited and you can’t escape. In terms of water quality and air quality issues, this is a population that cannot move without tremendous loss: the Tribe’s history, culture, all that streams from having a reservation. You can’t escape. That is why the Tribe has to be diligent about the advocacy efforts that you have in responding to a threat to a basic resource like the air you breathe. JO: The decision whether to leave was presented to the ancestors long ago and the decision was made. The Tribe stays. Chairman Nenema: Right. About thirty years ago I did an interview for a reporter with the Spokesman-Review about the River. What I told him: “When the River is gone, it’s gone.” This was before the newsprint mill, when a pulp mill wanted to move in. That didn’t last very long. There were a number of people in the area who wanted it because it would bring jobs. I was told later that if the pulp mill was allowed to come in, the fish wouldn’t even have time to say goodbye. People talk about the jobs that are needed to help the poor. These people prey on the vulnerable. And they’ll accept to have a job. When we bring these pollution issues up, we become the bad guy. The Tribe is getting more trust from the surrounding communities now that we are protecting what’s precious not only to us but to the surrounding communities. JO: Were you able to meet with Gov. 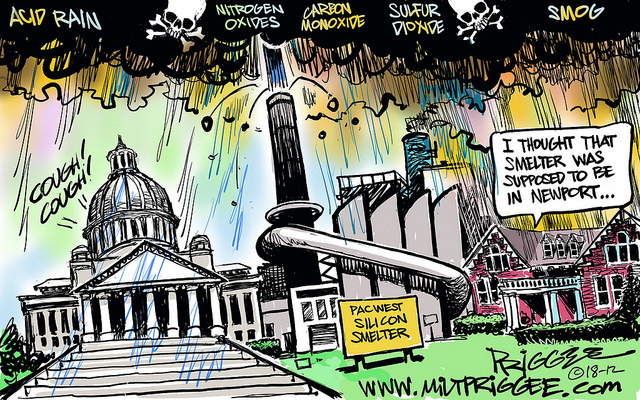 Inslee to raise the Tribe’s concerns about the smelter? Chairman Nenema: Yes, in Olympia. At the end of the meeting, he asked me if I had anything to say in order to close the meeting. We know that Inslee supported the grant that was given to Economic Development Commission (link). I told the Governor to send something better our way other than what you keep trying to do to us. I’ve really had a harder time after that meeting accepting the fact that he’s our governor. The things that he’s done are not looking out for our interests at all. That was one of the more disappointing meetings I’ve ever been in as far as an elected official. Bureau of Indian Affairs is another I have very little respect for. They have never done anything to protect us. But, they are under Congress. So that really tells you want they think about natives. Deane Osterman: The meeting with Inslee was the first time in my time, and in Glen’s time as Chairman, that all Tribal Council members travelled to attend a meeting on any single issue. The fact that the Governor’s Office failed to appreciate that, or understand that that’s a big deal, particularly for the Kalispel Tribe, spoke volumes. He and the Department of Commerce forgot that the Kalispel Tribe is based in the extreme northeastern corner of Washington. Forgot or never knew we were there. The mea culpas are just not enough: how is that possible? The meeting with the Governor was disappointing. We left with some pretty simple asks about some technical things that could have very easily been accomplished that still haven’t been. One is using site-specific meteorological data collected at the proposed PacWest site in Newport, Washington. And they have declined to do it. The Washington Department of Ecology has not required PacWest to use the data when it is part of the law and implementing regulations of the PSD permit. They have chosen to use experimentation to determine what the meteorological conditions are to go into their air models. So we are now a guinea pig in a regulatory process as well. This could easily have been resolved and that concern dispensed with if that had just put in the meteorological station. 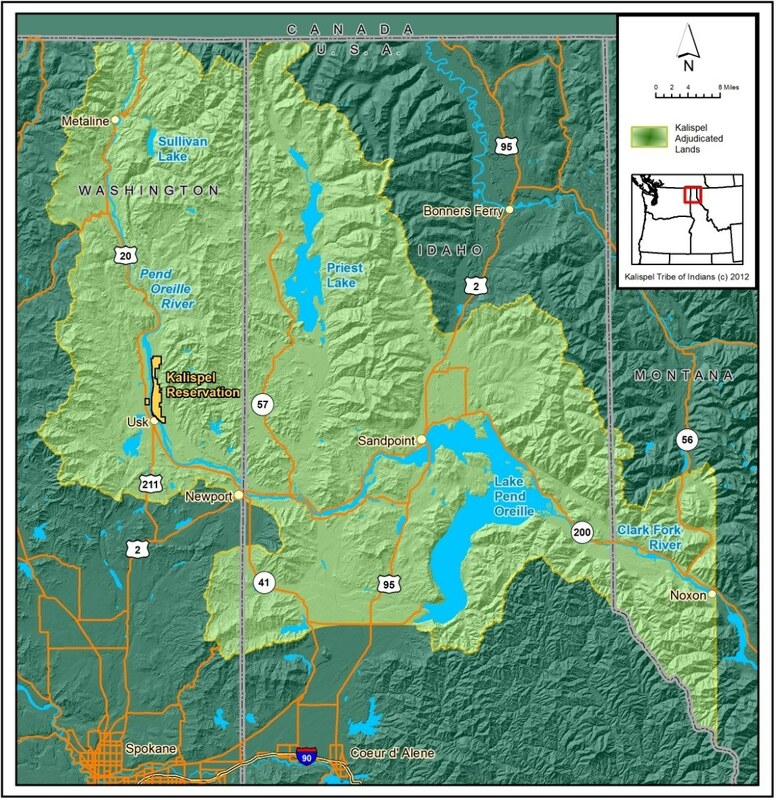 JO: The Kalispel Tribe is uniquely positioned to give advice about the Pend Oreille region because this is your homeland. What advice would the Tribe give people throughout the Inland Northwest who love and care the Pend Oreille River, Lake Pend Oreille, Priest Lake, and the greater Priest-Pend Oreille region? Chairman Nenema: We have to protect these resources that we have. I don’t think this is that last time we’ll have something come our way. Hopefully we’ll have support, more than we’ve had in the hard work that our people have done to educate others and to protect the resources. These resources are so precious. What we lose, will it ever recover? It is like our own health. We can’t keep ignoring our health or something bad will happen. That is what’s happening right now. I’d like to see the country wake up and start doing what’s important, what really matters. Deane Osterman: The principles that go with the last two questions are about method. We operate under a philosophy at the Tribe and the Natural Resource Department about good description. You must describe the current situation, whatever that is, as accurately as possible. Whether an air quality perspective, water quality parameters, what are influencing those. And operating from a very clear picture as best as we can, that represents reality. When you operate from a position that comes from a good, strong descriptive base, you can make really good policy decisions as you move forward. What so often happens is that there is a predetermined outcome in mind. People mess with the descriptive data so that they can get the outcome they want at the end. We see that all the time with our regulators. That is dangerous. We have prevailed in situations where we have encountered that problem, but brought good descriptive data to the argument and it carried the day. I’m not suggesting that it will always carry the day. But, it’s a good place to do it. When you have that, people can attach to it. The other piece that is important is that the Tribe collaborates very well and very strongly with other entities. If there is a similar value or similar sets of ideas about outcomes that we want, then we can really connect well. The story of the Pend Oreille River just 15 – 20 years ago, it was a slug fest. It was a fist fight every single day. Hostile meetings. Hostile interactions with other agencies. With the exception of the PacWest situation, all of that drama is gone. We are working with our utility partners to implement their licenses. We’re working with our federal regulators better than we have in the past, but we still challenge them on occasion. The Tribe is in a unique position that it can stitch all of these entities together. That is the luxury of the Tribe: we are not bound by statutory limitations. We don’t see boundaries between the State of Washington and the State of Idaho. We are not bound just by the Clean Water Act, like EPA and other agencies. We have the ability to be fluid and be able to pull the goodness out of one side and pull that piece, stitch it together, and have a more comprehensive plan about what happens in the whole Pend Oreille Basin. You might have seen the recent article about restoring fisheries. [Major fish recovery project in NE Washington and Idaho gives boost to cutthroat and bull trout]. That is just one sliver of the work on the Pend Oreille just dealing with native trout. There is strong mention of all of the collaborators in there: Bonneville Power, Corps of Engineers, Fish and Wildlife Service, WDFW, Pend Oreille PUD, Seattle City Light, the citizenry – all of them. If it wasn’t for the Tribe and the Tribe’s values, and how they have trained their Natural Resource Department or any other department that they have, you wouldn’t have a success story like this. Pure and simple. Because it comes right from the people. We can be the strong one lots of times, but you can’t get to the outcome if you don’t bring everyone else with you. That is part of the success story. We seek out those collaborative relationships. Sometimes they start rocky but end up strong. That is something important that we’ve learned from the Tribe. Julie Holland: The work is rewarding and never ending. When you finally accomplish something on one issue, something else rises to the top. You look at the photograph of Chief Masselow up on the wall. I don’t know how many times you, Chairman Nenema, have looked at that face. Does it make you fight a little harder? Chairman Nenema: Yes. When I see the young people and the social problems today and what they have ahead of them, we have to be stronger so they can survive the years ahead. It is not going to get easier. And that is what we hope to pass down to the next generations. Hopefully we are doing the best we can.